"Another bandit shouted, 'Catch this, clown.' and winged a mealy apple at Snow. She spun around and caught it easily, then whipped it back at him. Several audience members began throwing vegetables, flatware, and other various doodads at Snow; and - with twirls, flips, and hops in between - she caught and tossed back every one. The bandits were laughing and clapping as Snow bounced around the stage, using those gifted arms of hers in a juggling act with the entire audience. Why Kellee Thinks Snow Makes a Strong Role Model: One thing I love about the Hero's Guide books is that each princess is a completely different personality. Snow is representing the quiet, quirky girls. She is a loner, finds joy in solidarity, and loves nature. But, my favorite part about Snow is her and Duncan. They are a pure example of love. Although they can find themselves annoyed with each other, they always forgive and forget. Why Jen Thinks Snow Makes a Strong Role Model: I'm a total sucker for happy endings...but the whole premise of the League of Princes is that happy ever after might not be what we envision. And I can accept that just because one story ends, it doesn't mean that another story isn't beginning. And I can also accept that relationships have ups and downs and bumps along the way. But I still love my, if only temporary, happy endings. This is precisely why it makes me so happy to see Snow and Duncan still together. I'm just going to go ahead and say that Duncan is pretty goofy. What? He is. But Snow totally gets him and loves him despite his goofiness. Because of his goofiness? I don't know but it's really sweet. I love that she gains some confidence in this book, or that we see more of her talents and that she isn't just a sweet girl who talks to animals and hangs out with dwarves. When put in a difficult situation, Snow takes a deep breath and takes care of business much to even her own surprise. The quote, "Keep calm and carry on," comes to mind when I think of Snow. What do you think makes her a representative of girl power? 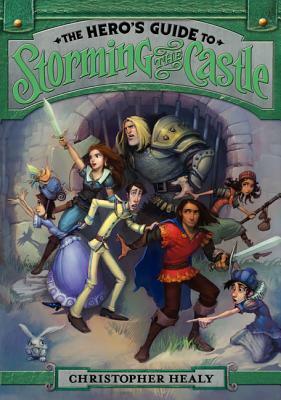 To enter our giveaway of a copy of The Hero's Guide to Storming the Castle by Chris Healy, please fill out the form. The winner will be chosen on Sunday, May 5th and announced on Monday, May 6th!